Porcelain Passion: The Refined Botanicals of Flora Danica | Skinner Inc. 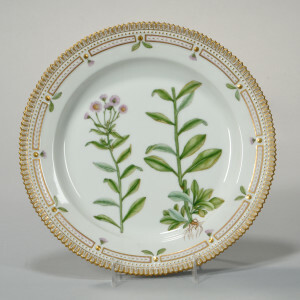 There are a robust 35 lots of Flora Danica porcelain tableware items (from a coffee service to egg cups, butter pats and plates of all sizes, platters, tureens and more) in Skinner’s European Furniture & Decorative Arts auction on October 7. For those who seek out Flora Danica’s beautifully rendered botanical specimens that are the “trademark” of the service, there will be something for everyone in this upcoming sale, and a perfect time to add to or start a collection. The original creation of Flora Danica porcelain is set within a great framework of artisan history. Madness for porcelain in the 18th century throughout Europe signified a devotion to creating skillful works of art using the finest techniques, and a showcase of design expertise that underscored the power and political prowess of royal courts on the Continent. In Germany, vibrant blues and greens were created by Meissen as the porcelain craze proliferated, and soon influenced some of the color palettes created by Sèvres in France. Louis XV became the sole owner of Sèvres in mid-18th century, and his mistress Madame du Pompadour’s thirst for Sèvres was insatiable. Their bright signature shade of blue, now known as Bleu Celeste, was exclusively used for his Louis XV’s first dining service. In Denmark, the power of porcelain created another taste for aesthetics, where bright colors were employed for painted botanical specimens. The royal family in Copenhagen designed a porcelain service, now being made today by Royal Copenhagen factory which produces the highly sought after pieces. Its elegant colors and details are enough to attract the attention of many, including Architectural Digest, who in a recent article written Spring this year, cited a stop at the Royal Copenhagen Factory to see their beautiful Flora Danica porcelain as one of the top reasons to visit Copenhagen. 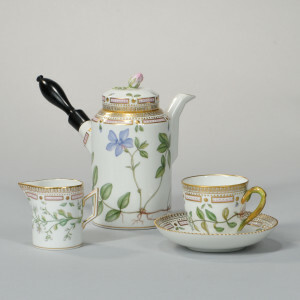 Danish king Christian VII ordered what is now known as Flora Danica porcelain to be produced in 1790 as a gift for Catherine the Great of Russia. 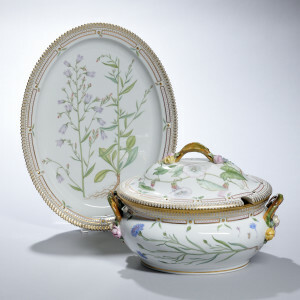 She was a great collector of porcelain, and sought other luxury goods, art, and literature to flourish in her court. However, Catherine the Great died only six years later in 1796, long before the service was completed in 1802, and the finished service stayed in Copenhagen, with the Danish royal family. Creation of Flora Danica porcelain was inspired by a hearty 51 volume taxonomy featuring botanical specimens of Denmark, and their intricately painted depiction on porcelain became a source of national pride. Copper plate prints of each specimen from the book were rendered by Johann Christoph Bayer for the porcelain service. Approximately 1500 pieces of the original service still exists today. The size of the original dessert service alone was over six hundred pieces, including trays and stands of all shapes and sizes, for every confection imaginable. In the mid-19th century, the production of Flora Danica was revived by the Danish royal family to commemorate the marriage of Princess Alexandra of Denmark to Edward VII, the future king of England. From that point on, Flora Danica has been made by Royal Copenhagen factory. This entry was posted in Blog and tagged Blue Celeste, boston, boston auction, Catherine the Great Russia, Danish royal family, decorative arts, European ceramics, European Decorative Arts auction, European porcelain, Flora Danica, Flora Danica porcelian, Louis XV, porcelain, porcelian tableware, Royal Copenhagen, Royal Copenhagen factory, skinner, skinner auctions by Gwendolyn L. Smith. Bookmark the permalink.